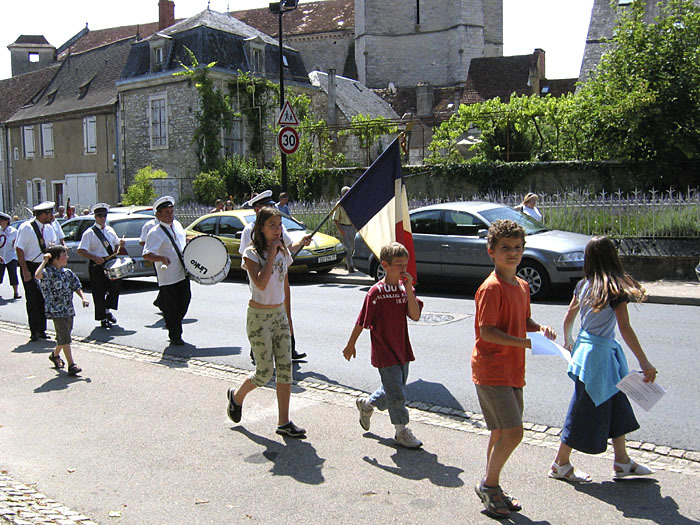 We'd seen signs about musical events and dancing to celebrate Bastille Day in Souillac, so we looked forward to a long evening in the streets. We began with a cafeteria breakfast in town--a bargain buffet, except for the bad coffee. We'd decided to drive a triangle through the areas of the lower Dordogne that had most impressed us other trips. This meant cafe lunch in Martel, just east of Souillac. We arrived just in time for the Bastille Day parade, an event that was limited to good intentions. Before lunch we visited the village market to buy soaps and cider. The lunch was good, and so was our lengthy conversation (stretching my French to the breaking point), with a charming man in a blue shirt who was having a full menu, aperitif, and a bottle of Chilean cabernet at the next table. His wife is a nuclear scientist. He gave us tips on travel in the area, and shared his opinions on politics, food, American wines, and many other subjects, then shared the last quarter of his Chilean red with us with warnings about French laws regarding alcohol and driving. We then drove east to Beaulieu-sur-Dordogne and were amazed by its transformation into a bustling tourist town, having seen it last when there was but one hotel and one restaurant open in early spring, 2003. The road northwest from there to below Brive is one of our favorite drives in all of France, and passes by Collanges-la-rouge, a village built entirely of rose-colored stone that we'd photographed on the earlier trip. The room was hot, so F went down for two hours of swimming and sunning. Pre-dinner drinks at La Beffroi turned into dinner reservations. We watched a band setting up its sound system and performing endless sound checks under the clock tower just by our table. The band, Encore Nous, turned out to be a note-perfect cover band for every Pink Floyd song you've ever heard, and their hours-long free concert beginning at 10pm was lots of fun. The tourists, including an American high-school tour-group, mostly stayed for the Pink Floyd concert. The locals however seemed to prefer the 2-man accordian and percussion band over by our hotel cafe, who played such French classics as Guantanaméra and My Way. We liked both concerts equally, since the crowd of locals were much less inhibited in their dancing and cheering, and seemed to enjoy themselves more than the Pink Floyd crowd. Well after midnight we headed to bed very tired.